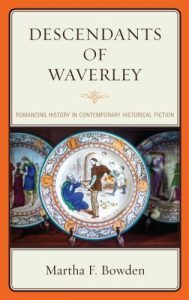 When I began thinking about writing Descendants of Waverly: Romancing History in Contemporary Historical Fiction (Bucknell University Press 2016) more than a decade ago, I was working within a set of assumptions that could only exist in an insufficiently researched critical framework. For example, I accepted the commonly held views that historical novels were defined by date- and character-driven markers (a certain distance in the past; a fictional character participating in a historical event or a historical figure whose interiority the novel reveals), that Sir Walter Scott “invented” the historical novel, and that the right way to go about the book was to choose a number of contemporary historical novels that take place in the eighteenth century, my area of expertise, and show where and how they get the period right or wrong, at the same time tying the whole thing, somehow, into the Waverley Novels. Tidy systems are always the result of insufficient information. A wise colleague pointed out that the third assumption would result in a mechanical and repetitive book. I was dubious about the second, because, after all, I had read A Journal of the Plague Year by Daniel Defoe and a little research negated it altogether. I found that Scott did not claim to have invented the form. In his introduction to the works of Defoe, he notes Defoe’s brilliance at bringing alive a historical event, and only regrets that he did not write a novel about the Great Fire of London. In the General Preface to the Magnum Edition of the Waverley Novels, he claims that “I felt that something might be attempted for my own country, of the same kind with that which Miss Edgeworth so fortunately achieved for Ireland,” identifying the regional novel as an ancestor . 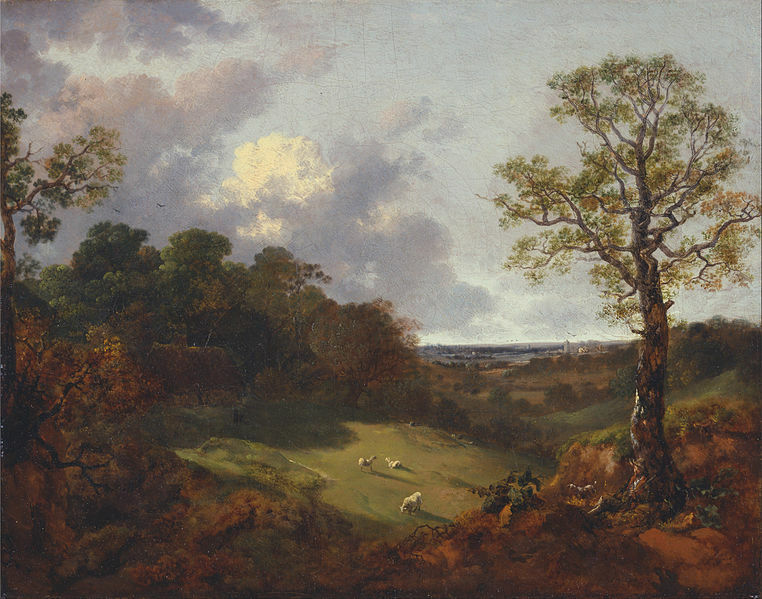 He also reveals what he learned when completing and revising Joseph Strutt’s historical novel, Queen-Hoo-Hall, in 1807-08, an attempt that failed: “I thought I was aware of the reason, and supposed that, by rendering his language too ancient, and displaying his antiquarian knowledge too liberally, the ingenious author had raised up an obstacle to his own success” (xvi). The first assumption stuck with me for a while, until I read Andrew Beahrs’s article, which develops a theory of the genre that interrogates not the what (period and character) but the how (the author’s method). From this article, I developed the theoretical model of the tensions between authenticity and accessibility, and the familiar and strange, both of which are exemplified in Scott’s assessment of Queen-Hoo-Hall . Scott did not invent the historical novel, but he did play an important part in both establishing the accepted version of it and in theorizing how it works. Next, I was startled by Scott’s description of his books as “historical romances,” and his proclivity for subtitling his novels “A Romance.” Another assumption was the standard history of the novel: an evolutionary development in which the romance mutated into the modern novel and thus disappeared. Clearly, that was not the case when it comes to historical fiction. Anne H. Stevens’s work helped me see how the historical novel gradually disentangled itself from Gothic fiction, which was also described as “romance” in the period. The idea of romance, which vivifies the historical record, adding emotions, motivations, conversations and all those details of an event that are never recorded, became the central idea in my book, the effect created by the tensions inherent in the form. The liberation from the mechanical casebook approach allowed me to write a text that reworks the history of the novel as a genealogical rather than evolutionary growth. Writers of historical fiction today need not have read a Waverley Novel in order to be influenced by him, any more than we need to know who our great-great-grandparents are for our genes to be affected by them. The first section contains two chapters that develop this critical framework. In the second, I devote two chapters to the establishment of authenticity while retaining accessibility, the first on literary intertextuality and the second on the use of images, such as portraits, both historical and fictional. Readers of historical fiction are interested in the “truth” of the narrative, but they generally are concerned about the what and I am interested in the how, which is the function of romance. The third section covers the metamorphosis of the form, with the first chapter discussing three subgenres: the embedded narrative, the historical detective novel, and young adult fiction. It ends with an analysis of Iain Pears’s Stone’s Fall, which fuses most of the genres that I discuss in this section. Just as we don’t have just one set of great-grandparents, so the historical novel, while retaining the tensions, the movement into the grey, unknown spaces, and the romance of its earliest forms, has developed a hybridity through the influence of new genres. John Frow’s article  gave me a way to describe what happens when C. J. Sansom combines a classic historical form with the equally classic detective novel. It is not necessary for the Shardlake series to reside in one and only one generic box. We can discuss it in the context of historical fiction or detective fiction, as a historical novel with detective fiction characteristics, or as a detective novel with a historical setting. The second chapter is dedicated to biographical romance, the most common of the contemporary developments. The third and final chapter engages with “the historical novel at play,” those fictions that combine historical situations with elements of the supernatural and narrative playfulness. I realize that there are other subgenres of historical fiction, but I had to stop somewhere, and these five forms are representative of the wider scope of the genre. Writing this book was a great pleasure because it allowed me to investigate one of my favorite forms of fiction while employing my scholarly interest in the development of the novel. I realized that I have been reading historical fiction for most of my life; the first playground reading recommendation that I remember was from a classmate who loved Elizabeth Speare’s The Witch of Blackbird Pond. 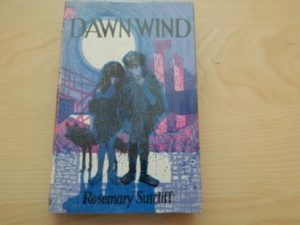 In the young adult fiction section I return to another early love, Rosemary Sutcliff, whose books I first discovered on those magical shelves of books at the back of my elementary and middle school classrooms. The Dawn Wind is the one I remember most clearly from those days; this book allowed me to discover more of her work. The good news is that, even after years of scholarly investigation, I still read historical fiction for pleasure. The cover of the book shows three of my 1880 Wedgwood plates depicting scenes from Ivanhoe, photographed by Lauren Holt. I am very grateful to Bucknell University Press and Rowman & Littlefield for giving me this kind of latitude to get an image that is just right for the book, and for Lauren Holt’s professional expertise. “Scott on Defoe’s Life and Works, 1810, 1817,” in Defoe: The Critical Heritage, ed. Pat Rogers, 66-69, 1972; see also his references in to Defoe in “Essay on Romance.” Walter Scott, “General Preface,” The Waverley Novels, Volume I: Waverley. Magnum Edition, 48 vols, 3rd ed. Edinburgh and London, 1830, xiii. Andrew Beahrs, “Making History: Establishing Authority in Period Fiction.” Writer’s Chronicle, 38, no.1 (September 2005): 34-40. John Frow, “‘Reproducibles, Rubrics, and Everything You Need’: Genre Theory Today.” PMLA 122, no. 5 (October 2007): 1626-34. The period from 1790 to 1820 was a significant moment in British women’s literary history. During this period more women published novels than men, even as the novel was solidifying as a respected literary genre. 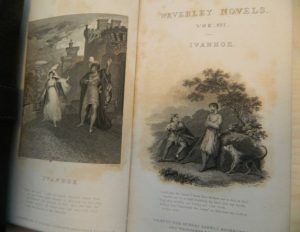 By the end of this period the novel was reputable enough a medium for Sir Walter Scott, celebrated poet, to pen the wildly successful Waverly series (1814). His success, however, came on the backs of the many women novelists who paved the way before him in the previous thirty years. But what was the contemporary critical response to such a momentous period in the history of the British novel? 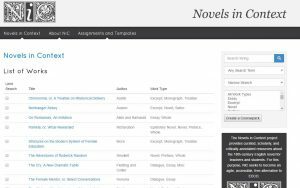 The Novels Reviewed Database, 1790-1820 (NRD) seeks to uncover just that. The NRD is the first and only database to focus on one genre’s historical reception. Cataloging reviews of novels from the period’s two foremost review periodicals, the Monthly Review and the Critical Review, the NRD brings together book reviews and book market data, providing a repository of criticism reacting in print to this period in the novel’s, and women’s, literary history. The NRD includes 1,836 book reviews, representing 1,215 novels and 445 identified authors. 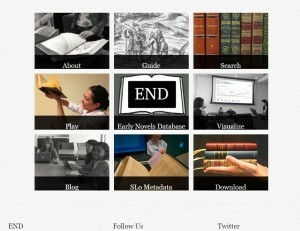 It features transcriptions of review criticism as well as data on women writers, novels, and review periodical makeup. The NRD contains a unique combination of contemporary primary sources that speak to the novel’s solidification as a literary genre during this period, including review articles, advertisements, and novel prefaces, many from archival sources not available digitally. The NRD also offers a data-set by which distant reading of this period in literary history can be explored, uncovering for the first time the Reviews’ role in shaping our modern novel canon. Distant reading studies of the novel, such as this study from the NRD of publisher William Lane, offer a new means of asking questions about the history of the novel and how contemporaries experienced its evolution. 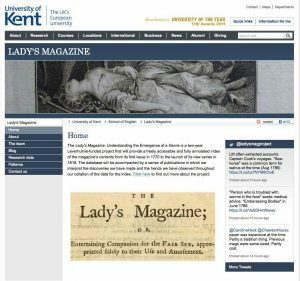 Its scope enables the NRD to encourage a broad survey of the literary marketplace in which the novel grew in the late eighteenth century, one that brings forward the many anonymously published and still obscure women novelists from this period that are often neglected in our study of the novel. The NRD presents opportunities for text mining review criticism, tracing economic market changes in novel production and sales, or publishers’ trends, tracking the novel’s evolving gendered authorship, understanding how reviewers discussed and understood a novel’s authorial gender, and excavating growing genre parameters by which the novel was evaluated and effectively produced. The NRD is currently in Phase I of three phases of development. 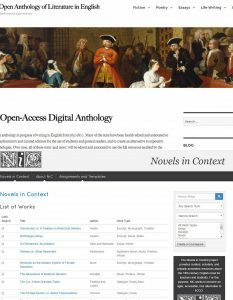 Phase I features transcriptions of review criticism—criticism that due to poor OCR in digital archives and scattered periodicals collections, are currently unavailable to most scholars. The NRD seeks to make this text corpus available to scholars in an open-access relational database platform. 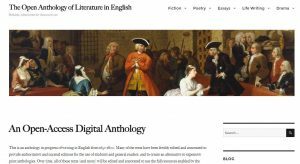 This platform, Phase II, which introduces a review bibliography, novel publication data, and authorial gender demographics, is under construction with hopes of a 2017 release. Phase III will provide users with review page images and the ability to read issues of the Reviews in their entirety, tagged review subjects and the power to create their own tagging profile, and a formula builder to manipulate NRD data for their own research.